Darrang College Recruitment 2018 August , Adhoc or Temporary Vacant Posts :- Darrang College Latest Recruitment 2018 notification is out in the month of August 2018. According to the latest Darrang College Recruitment 2018 August notification, Applications are invited for the following Ad-Hoc / Temporary vacancies in Darrang College, Tezpur. Interested candidates may submit their applications along with Bio Data to the College E-mail on or before 10th of August, 2018. The date of interview will be communicated through College website. 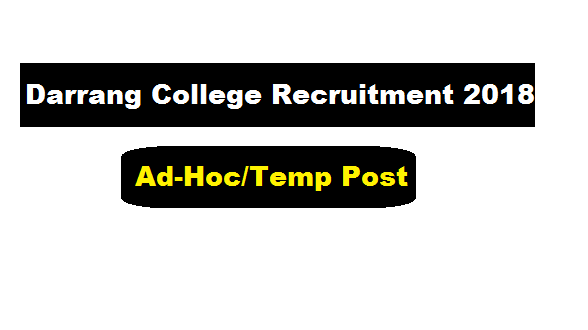 In this section, we will discuss in detail about Recruitment of temporary posts under Darrang College Recruitment 2018 August with all the details and requirement. Educational Qualification: As per UGC Norms and NET / SLET Candidates will get preference.